Thanksgiving is a special day on which people always want to show their gratitude to the God and friends who have loved and helped them. There are many means of expressing sincere thankfulness, and one of the most popular ways is to send text messages with your iPhone to those you like, especial if they're in the distant. However, accident always happens, sometimes these precious Thanksgiving messages you sent or received are mistakenly deleted or lost. No worries. This article will give you 3 possible ways to retrieve Thanksgiving text messages with ease. In case your emotional Thanksgiving messages are lost accidentally and you even did not have time to make any backup, you can still get them back from iPhone directly as long as they didn't be overwritten by the newer data on your device. 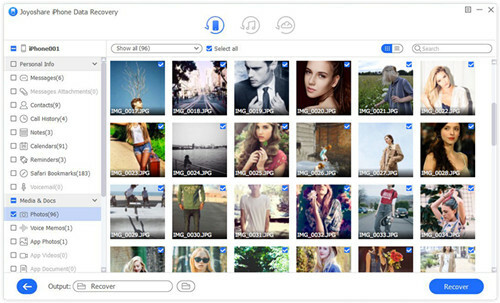 What you need now is a professional third-party data recovery utility and the most trustworthy one is Joyoshare iPhone Data Recovery for Windows (or for Mac). No matter how you lost your Thanksgiving messages, such as iOS upgrade failure, forgotten passcode, system crash, virus attack, etc., this powerful tool can salvage them from iPhone, iTunes or iCloud backup in a very high successful rate. Not only Thanksgiving messages from SMS, others messages from WhatsApp, Viber, Kik and other chat platforms can also be retrieved. Additionally, you can preview these Thanksgiving messages and then choose to recover them selectively. 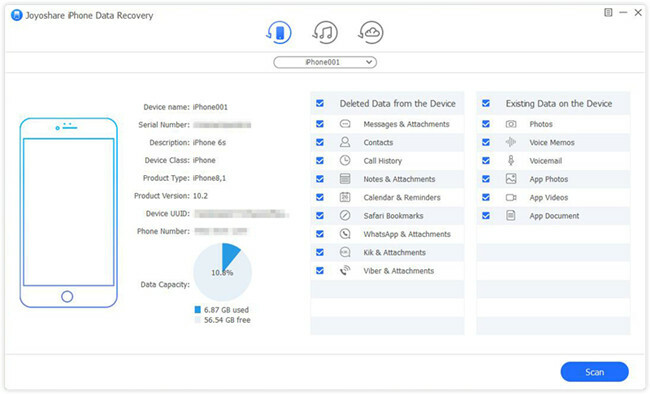 Now let's show you how to recover deleted or lost Thanksgiving messages from iPhone without backup by using Joyoshare iPhone Data Recovery. First of all, please make sure you have downloaded Joyoshare iPhone Data Recovery and installed it on the PC or Mac. Use an original USB cable to connect your iPhone to the computer. Next launch Joyoshare iPhone Data Recovery on the desktop and it will automatically recognize your iPhone. 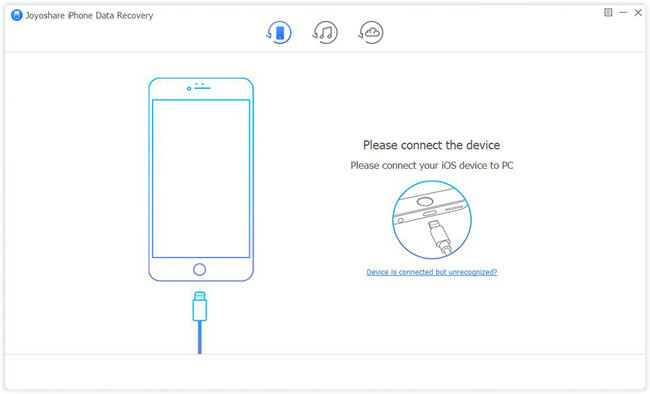 Once Joyoshare detected your device successfully, you'll enter the "Recover from iDevice" mode by default, where you can see the basic info of your phone on the left side and the data types that you want to recover on the right side. Tick the ones that may contains your missing Thanksgiving messages such as "Messages & Attachments", "WhatsApp & Attachments" "Viber & Attachments" "Kik & Attachments", etc. or just keep it all checked, and then click the "Scan" button to let Joyoshare start to scan the lost Thanksgiving messages. Wait a few minutes until the scanning process completes. Now all recoverable messages are shown in categories. Preview them one by one and find your lost Thanksgiving messages. You can also search for a specific one by entering a keyword in the search box or filtering out the "Only show the deleted" option. Next just press the "Recover" button to export and save Thanksgiving messages to the local folder of your computer. Note: You can also use Joyoshare iPhone Data Recovery to recover Thanksgiving messages from iTunes or iCloud backup file if you have one by switching to the "Recover from iTunes" or "Recover from iCloud" mode. If you have updated your iTunes backup and your lost Thanksgiving messages might be included in it, you can now recover them by restoring iTunes backup. It only needs a few steps to retrieve deleted Thanksgiving messages by using this method. Step 3. Choose the iTunes backup file you want to recover and press the "Restore" button. Wait a while until it's done. Please keep your iPhone connected during the restoration. Note: By restoring iTunes backup means it will replace the existing data on your device, so please back up it if needed. Alternatively, if you have kept iCloud backup turned on, you can recover deleted or lost Thanksgiving messages from iCloud backup as well. 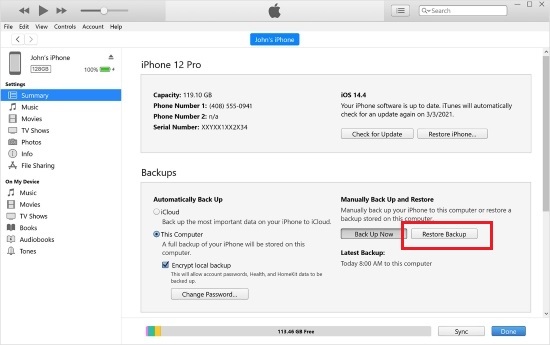 Restoring iCloud backup for getting Thanksgiving messages is very easy and here is how. Step 3. Sign in your iCloud account after entering correct Apple ID and passcode. Pick the backup file that may have your lost Thanksgiving messages and start to restore them. When the progress bar is completed, your Thanksgiving messages will come back to your iPhone. 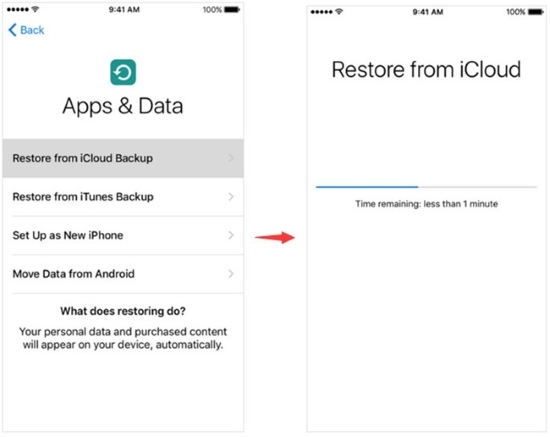 Note: Please make a backup for the existing data of your device because restoring iCloud backup needs you to erase all current at first.